"There once was a girl… no one dare speak her name." Paramount has debuted a new trailer for the horror sequel Rings, the third film in the Ring series, originally a remake of the Japanese horror series. This film is finally, supposedly, being released in February this year, after being delayed from late 2016. The second film was released in 2005, three years after the first Ring hit theaters in 2002. This new one picks up 13 years after the first film and it looks like it's just as freaky. Starring Laura Wiggins, Aimee Teegarden, Johnny Galecki, Lizzie Brocheré, Alex Roe, Zach Roerig, and Bonnie Morgan as Samara. Horror films in the winter usually do well, and I'm sure this one will find an audience - no matter how delayed it is. You can also still watch the first official trailer for Rings here, to see more footage from this sequel. A young woman becomes worried about her boyfriend when he explores a dark subculture surrounding a mysterious videotape said to kill the watcher seven days after he has viewed it. 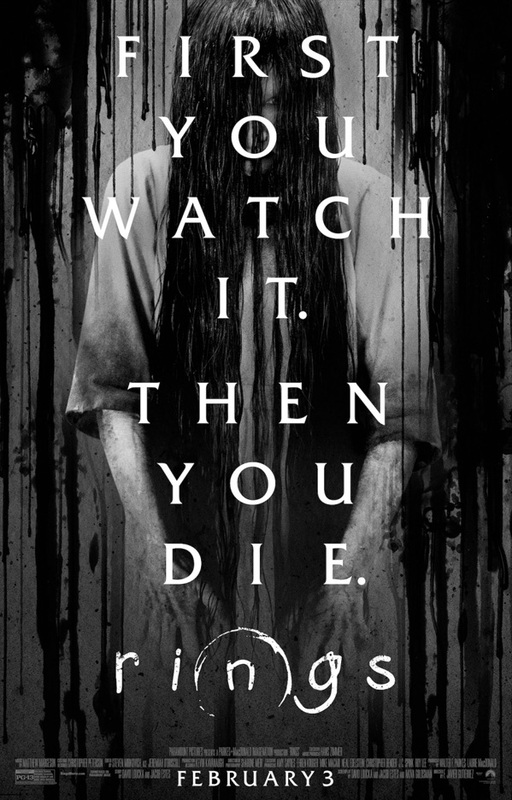 She sacrifices herself to save her boyfriend and in doing so makes a horrifying discovery: there is a "movie within the movie" that no one has ever seen before… The Ring Two continued 6 months after the first movie and this film picks up 13 years after the first movie. Rings is directed by Spanish filmmaker F. Javier Gutiérrez, of crime film Before the Fall (Tres días) previously. Follow him on Twitter @FJ6utierrez. The screenplay is credited to Jacob Aaron Estes, Akiva Goldsman and David Loucka; based on the novel by Kôji Suzuki. Paramount will release Rings in theaters starting February 3rd coming up this winter. Anyone interested in seeing this? God this looks awful... I loved the original Japanese film when it first came out and I enjoyed the rather faithful first American adaptation too, but this just looks like Hollywood execs trying to trade on brand recognition and trying to merge a Japanese idea with the boring and creativity bereft biblical nonsense of the Conjuring films. I think it looks fun. DOTPOLS - you can stay home and play with yourself, and the rest of us will allow the movie to entertain us. Cheers!